Pere Mabeuf’s final days are a slow slide into deprivation and despair. He sells the printing plates, the furniture, and finally moves onto his prized books for food. In the end he sells the last of them for medicine for Mere Plutarque…who probably won’t outlast him very long. With nothing left, he walks outside… and keeps walking. M. Gillenormand is physically as comfortable as one could expect to be at 91 in 1832, but the man who arranged things so that Marius’ father would die before meeting his son again, is now afraid he’ll die before Marius returns. I suppose I should be sympathetic, but he earned that. This entry was posted in Book Commentary and tagged Gillenormand, Mabeuf, Marius on May 22, 2018 by Kelson Vibber. Pere Mabeuf: Kindly, his only political philosophy is “book-ism.” He can’t imagine why people would bother hating each other over such trivialities as political opinions when there are so many fascinating plants and books they could be exploring instead. Sadly, his hyper-focus causes him to miss the signs that his financial situation is deteriorating. He’s really an underappreciated character. M. Gillenormand (Marius’ grandfather): after reading the morning news, he rants about kids these days, their sloppy dressing, entitlement, disrespect for political systems that were good enough back in his day, disparages their masculinity, makes racist comparisons, and declares all news media a scourge. It’s presented as ridiculous. And it is. But it’s also depressing in how familiar it is, more than 150 years later. Not just that an old man is angrily shouting at the news, but that it’s what you’d expect from an old man shouting at the news today. This entry was posted in Book Commentary and tagged Gillenormand, Mabeuf on April 15, 2018 by Kelson Vibber. Hugo has a tendency to thoroughly describe the setting and characters first, and then tell you what they do there. He actually describes the members of M. Gillenormand’s favorite salon in much the same way – and detail – as the ABC students, even though they disappear from the narrative quickly. It’s like taking the time to introduce everyone who appears in the Mos Eisley Cantina. Or maybe Canto Bight, because the casino and the salon are both in the story to say something about society. The Cantina is mainly there to point out Luke’s naivete. Don’t get me wrong, I remember Tales From the Mos Eisley Cantina being a fun read, but A New Hope didn’t come to dead stop while we learned everyone’s backstory only to never see them again. This entry was posted in Book Commentary and tagged Gillenormand on April 11, 2018 by Kelson Vibber. Javert is no longer a threat to Jean Valjean, Marius is alive and reconciled with his grandfather, and he and Cosette have a chance to be together. But happy endings don’t just happen, you still have to build them. Boulatruelle, the rascal of Montfermeil, shows up one last time when he misses the chance to catch Jean Valjean digging up the last of his buried treasure — the candlesticks, and the rest of the money he earned as M. Madeleine. Apparently Boulatruelle was too drunk during the extortion attempt for the police to be able to prove intent. Marius’ slow recovery (he’s got both a shattered shoulder and severe head trauma) actually saves him from prosecution. By the time he’s well enough to arrest (three months), the authorities just want to put the whole matter behind them and not re-inflame public opinion. His convalescence takes place entirely at home, with house calls from the doctor. These days, he would have spent his months of coma/delirium in the hospital. Back in 1832, it’s probably just as well he didn’t, because this was before people understood germs and the need for sanitation. M. Gillenormand doesn’t pay much attention to names, and manages to get Valjean’s alias wrong — “M. Tranchelevent” even after he’s been inquiring after Marius’ condition on a daily basis for four months, and even after researching this Cosette girl whom Marius seems so fond of. He’s also so relieved to have Marius back that he abandons all his old political views in favor of everyone under his roof being happy. Once Marius is well enough to be aware of his surroundings, he’s all set to have to fight to see Cosette…and his grandfather says, oh, yeah, her father stops by every day to check on you, now that you’re awake, you can see her tomorrow. They’re engaged by December, a February date chosen based on the doctor’s advice. “Marius, my boy, you are a baron and you are rich. Don’t, I beseech, you, waste your time lawyering.” – G.
Valjean goes to a lot of trouble to separate Cosette from his own legal troubles (and her own murky past). He establishes a fake family history for her, claiming to be not her adoptive father but her biological uncle. The real Fauchelevent isn’t around to dispute the claim anymore, and the nuns never really paid attention to which Fauchelevent “brother” was Cosette’s father, so they’re happy to sign off on it. He also fakes an injury so that he can’t sign any papers related to the marriage, since doing so might invalidate them. Meanwhile the money from Madeleine’s factory is placed in a trust in Cosette’s name, bequeathed anonymously. It turns out she’s rich, although her father — uncle — whatever — isn’t. Marius and Valjean never speak of their experiences at the barricade. Actually they don’t speak much at all, though every once in a while they find something to talk about, like the importance of free education. As Marius recovers, he sets about looking for his father’s rescuer and his own, in order to pay his debts to them before starting life with Cosette. No luck on either account, as Thénardier has gone to ground (having been sentenced to death in absentia), his wife has died in prison, and no one recognized the man who brought Marius to the door with Javert — not even Gillenormand’s doorman. I can’t help but read this as meta-commentary: “Paris, let us admit it, is very ready to be amused by what is ignoble. 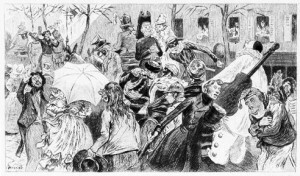 All she asks of her masters is – make squalor pleasant to look at.” Certainly the parodies of the musical like to point this out: “Les Mousserables”‘ “Mixed Emotions” rating, or Forbidden Broadway’s line about “Rich folks pay fifty bucks a shirt / that has a starving pauper on it.” The novel is a call for social change, but that element is a lot thinner when you remove it by 150 years and condense the story into a three-hour piece of entertainment, even when you make the effort to show things as gritty and painful as they did in the movie. Azelma finally gets something to do! She and her father, the last surviving Thénardiers, spot the wedding procession, and her father sets her to research the couple. Chapter title: “Jean Valjean still has his arm in a sling.” Ooh, how exciting! 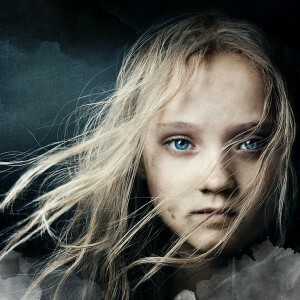 Cosette’s dress is beautiful. So is Marius’ hair. Also, now that they’re married, Marius can stare at “the pink objects vaguely to be discerned beneath the lace of her corsage.” Hubba hubba. Théodule is of course at the wedding, which makes me wonder what he was up to during the revolt back in June. He’s stationed in the city, so he probably would have been involved in the fighting. Come to think of it, I’m surprised Hugo didn’t use the opportunity to show a view of the insurrection from the other side…or at least a conversation between cousins. I’m not sure we ever see him and Marius interact at all. The old man who used to rant at the slightest provocation is now rambling about joy and love at, well, the slightest provocation. It’s a complete reversal. G: “That in fact there are unhappy people is a disgrace to the blue of the sky.” — I’m not sure if he’s offended by the circumstances that make people unhappy or that the unhappy people exist. 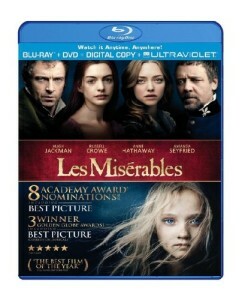 Don’t get your hopes up for too happy an ending to Les Misérables, though. Even if you haven’t seen the play or movie, you know the title. Pages covered: 1110-1139, more or less. A few bits of Valjean’s legal maneuverings are actually revealed a little bit later, in the conversation with Marius after the wedding, but this seemed like a better way to break things up. Image by Jeanniot from an unidentified edition of Les Misérables, via the Pont-au-Change illustration gallery. This entry was posted in Book Commentary and tagged Azelma, Boulatruelle, Cosette, Gillenormand, Jean Valjean, Marius, Paris, Thenardiers, Theodule, Wedding on December 30, 2013 by Kelson Vibber.